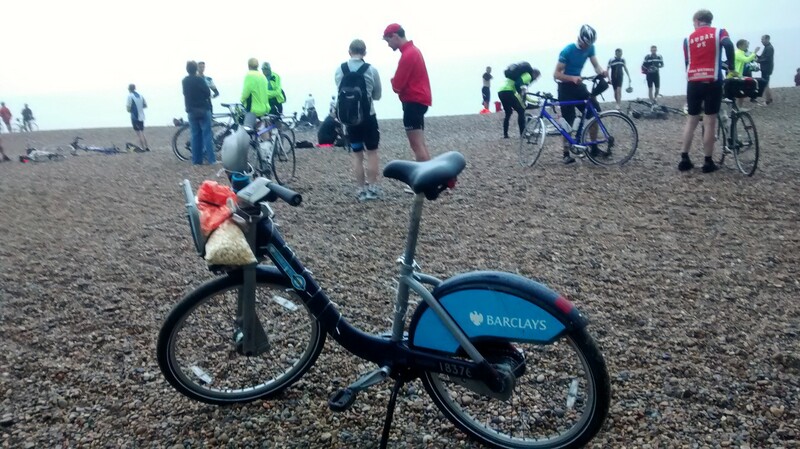 Last weekend I decided to ride, for the second time, the Dunwich Dynamo – a 120ish mile bike ride from London Fields in Hackney, London, overnight to the beach at Dunwich, about 30 miles north of Ipswich. This is not a cyclosportive that you pay to enter, there’s no chip timing or stations with energy gels: this ride is all about camaraderie and the journey itself. The main difference between my ride last year, which ended prematurely with a slashed tyre, and this year, is that this year I decided at the last minute (on the Wednesday before, to be precice), to ride it on a Boris bike. For folk outside of London who are not au fait with a Boris bike, it’s a monstrosity of a hire bicycle (officially designated “Barclays Cycle Hire”), designed to withstand thousands of separate short usages. In the rules, one is permitted to ride one for up to 24 hours. So, with that in mind, I joined the thousands of others at London Fields and pushed off into the last of the summer sunshine. Next stop: Dunwich! Ah, one other minor detail – shortly before pushing off I decided to purchase a huge bag of delicious popcorn, freshly popped in a local market by Drum & Kettle. Given that I wasn’t going to set any land speed records, I wanted to try out popcorn as my main source of long distance nutrition. The ride was nothing short of beautiful. With a couple of friends, one on a bling full carbon road bike (but with BMX pedals??) and another riding his trusty fixie, we cruised out of London, through Epping Forest, using the same roads the the Tour de France had taken just days before but in the other direction). As night approached, riders had started to find natural groupings. There was still plenty of street lighting and light pollution from the cities, but there was a calm as we rolled through suburbia. As faster riders overtook me, they started to shout “Boris!”, at me, at the bike, just generally in my vicinity. I wondered what to shout back as each encounter only lasting a few seconds, but by the end of the night I had build up a mental database of platitudes to fire back in rapid response. My favourite nickname that I received over the evening was definitely “Mr Popcorn”, soon followed by “Popcorn Boris”. The first pub stop – that’s right, this ride has pub stops, and plenty of them – was where I has ended up spending the night last year after my tyre sidewall slashed open, so I was keen to push on beyond it. The ride continued from town and village to the next, with Saturday night revelers wishing us well as they stumbled from bar to bar. Not long later, having been dropped by my friends, I joined some for a pint of beer and some well-earned popcorn, which hit the spot just right! After pub shutting time, I noticed that pubs on the route were still open and supporters had marquees up, selling snacks and on occasion giving away free hot drinks. Although my friends were elsewhere on the ride, I chatted with other riders and befriended people at stops. Families were still cheering riders on whilst sat at the roadside in pyjamas and dressing gowns. Fairy lights lit the correct way at junctions. The moon shone full above, and the rain fell everywhere apart from where I was riding. There was definitely a touch of magic on this ride. After the halfway, I started to enjoy every moment, knowing that all too soon the ride would be over. I still remember one marquee, about 25 miles from the finish, serving melt-in-your-mouth pulled lamb baps with free coffee. At three something in the morning, just as daylight was breaking, after riding hard for several hours, I could think of nothing tastier. 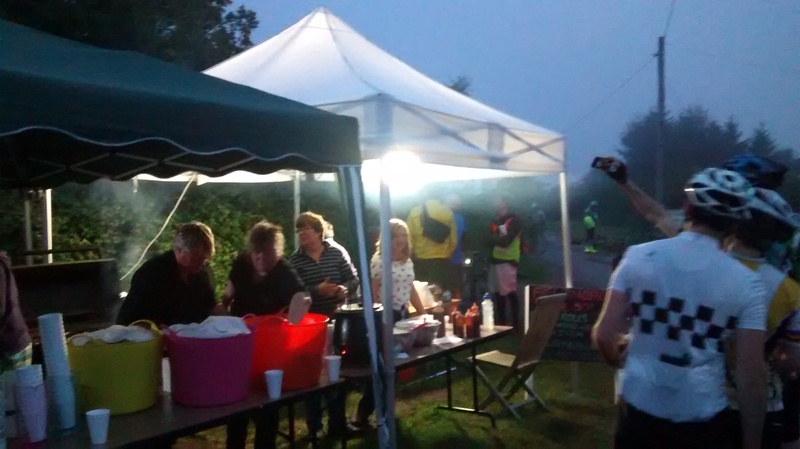 Volunteers feed hungry and thirsty cyclists. Thank you! The last few miles into Dunwich were a free for all- people took various routes to get there. I joined a group of young riders and followed them in, proverbially towing a guy on a road bike who drafted the last few miles behind me! Despite a mixed weather forecast, I had managed to miss all of the rain, and made it to the pebbled beach in Dunwich just before the heavens finally opened above me and rained down hard. At Dunwich I had strangers congratulate me, take photos with me, one lady even asked me if the popcorn held some symbolic meaning (it didn’t – it turns out it is just not very practical to eat whilst cycling!) and I enjoyed the delights of a fried breakfast in the local pub, reunited with my friends (who it turns out I’d overtaken!) With a full stomach, I started to nod off to sleep at 7am as shared pub conversation came to the topic of the guy riding a Boris bike with a bag of popcorn. In the corner of the pub, I chuckled quietly to myself, and let myself drift off into a short and blissful sleep. After a 20 minute nap, my friends and I cycled the five miles to Darsham to catch a specially commissioned train service back to Ipswich and on to London, and I shared my ample popcorn supply with surrounding hungry cyclists. Big respect to Southwark Cyclists for keeping this free event going and for organising return coaches. 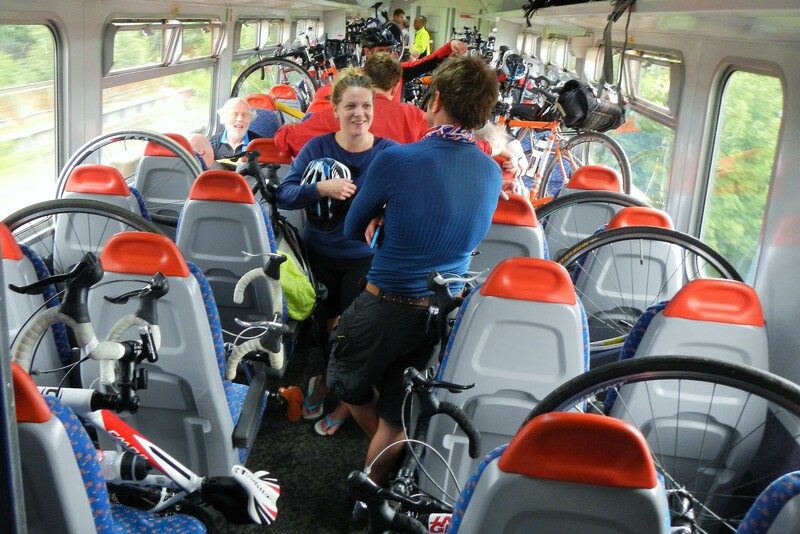 Thanks to the train company that put on special bicycle services. Thanks to all the supporters who cheered riders on through the night, in their pyjamas. Thanks to the volunteers and publicans who stayed up all night to feed us. Most of all, thanks to the other riders, without whom this would not have been nearly as memorable as it was. There are three gears and they are all granny gears, so gentle hills are not an issue, apart from the weight. There’s a sweet spot of about a 5% incline when the gearing seemed just ride to ride hard in the biggest gear when it is easy to make good relative progress. It is possible to adopt an aero position on the Boris bike -pedal hard on the downhill then cruise in this position for maximum benefit. Overtaking road cyclists is funny,but they will catch you once the road levels out. The seat is surprisingly comfy, and the upright position keeps your back and neck muscles relaxed compared to road / TT bikes. Expect a LOT of attention – I really did not expect to see photos of myself and the bike all over Instagram, Twitter, Facebook, blogs and other media. Would I do it again? No – it’s been done before, in fact this year I wasn’t the only person on a Boris bike. There were other people riding way more interesting bikes – tandems, BMXs and contraptions that don’t even have a proper name. However, as with so many things that start off as an inkling of an idea, someone told me that I clearly handled this bike well, and that I should consider entering the Boris Bike category of the London Nocturne next year… Never say never! Keep doing things that put a smile on your face!